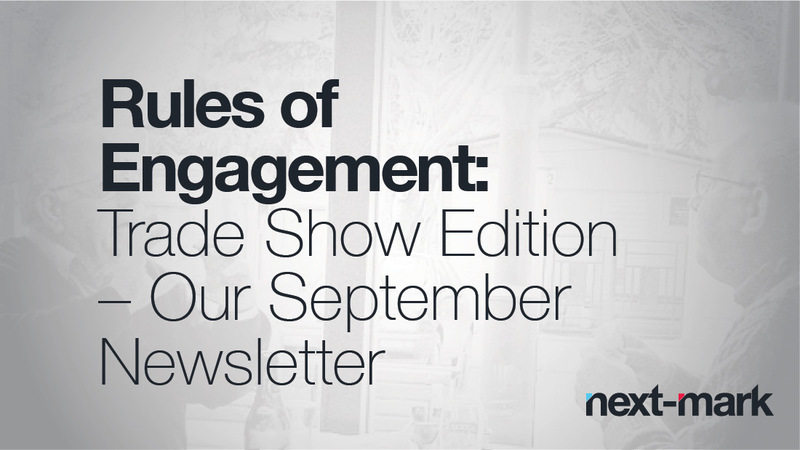 At Next-Mark, we believe in engagement. To us, that means to get the attention of viable prospects, start meaningful conversations and, ultimately, create mutually beneficial, ongoing relationships. For trade shows, this engagement is a process that should begin well before anyone steps up to your booth. As we prepare for the fall trade show season, we thought we’d give you an inside look at what is an extremely front-loaded endeavor. It all starts with a powerful idea, something that will help you stand out and encourage interest. That involves knowing what you’re going to do and the products and services you’re going to introduce/highlight as far in advance as possible. Your plan should be cohesive, with all pieces fitting together to tell a complete story. Everyone knows there’s an art to effective use of pre-show ads, public relations, email and social media to create awareness and fill your show appointment schedule. What many companies forget, however, is that that art should be grounded in the sciences of persuasive communication and strategic messaging. No matter how inventive your concept, there’s always a way to tell/remind the audience why they need your product, not just where they can pick up a t-shirt. Okay, picking up a t-shirt can be a draw. People love swag, so having something for them to toss in their show bag can be a plus. That said, the point is to have it go home with them, making the cut when they decide what to pack. Another hot draw is “gamification,” in which game thinking and mechanics are used to create competitive activities, or “spin-to-wins” that incorporate industry language and market characteristics. Though not new, video and digital communications can also be powerful at trade shows. When concise and well produced, these visuals can create a pause that opens the door to engagement. In this same vein, value-added materials such as topical white papers and case studies made available at shows can be the “keeper” you’re looking for while establishing your company as an expert. Starting early also gives you time to volunteer that expertise with participation in panels and sessions, partnering with clients to present case studies, introducing ways to solve common problems or giving your organization’s take on industry issues. And while these active participants are getting ready for the spotlight, take the time to build a strong show team with a diverse group of people who can address a wide variety of questions and issues. Make sure every member of that team knows your goals and is trained in your messaging. Finally, this is also the time to create your post-show follow-up plan – that is, just what exactly you’re going to do with all those names you’ve collected, leads you’ve identified and promises you’ve made. Build on demonstrations, giveaways and games with a good conversation about your products. You (and/or your agency) came up with all those good ideas to attract participants; don’t forget why you did it. Keep in mind that this is just the beginning of what could become a long-term relationship. Strive to establish your expertise and attentiveness to needs with each and every person you engage. Unless you might be called to perform brain surgery at any moment, turn off your phone and forget your email. The most important thing you have to do that day could be walking past you. Trade shows can be physically exhausting and being “on” all the time can be emotionally draining. Still, it all will be over with soon enough, and the rewards can be significant. Keeping your eye on the prize (prospects) and your mind on your task (engagement) can make the hours fly – and dollars flow. After taking a quick look at your post-show plan and tweaking it, if necessary, execute it immediately, while the show and conversations are still top of mind. Once that’s done, as we’ve advised before, catalog your lessons learned and use them to create an even stronger plan for next time. At Next-Mark, we have extensive experience developing, designing and managing trade shows in a broad range of industries.